Marriage is one of the seven Sacraments of the Armenian Orthodox Church. Couples are asked to contact the Church Office several months prior to the date of a wedding to confirm the availability of the Pastor and Church. Both parties must be baptized Christians and at least one must be a confirmed member of the Armenian Apostolic Orthodox Church. It is the responsibility of the couple to present a valid license to the Pastor prior to the service. All members of the wedding party must also be Christian, including the Brother-in-the-Cross (Khatchnyekhpayr), who must also be a member of the Armenian Orthodox Church. Invitation of other participating clergy must first be discussed with the Pastor who, upon approval, shall make all arrangements of invitation for such through his office. In preparation of their new life together, the couple is asked to receive Holy Communion (usually one-week prior to the wedding ceremony). Weddings rehearsals must also be arranged with the Pastor, and all members who are to participate in the ceremony are asked to be present. Photographs and/or video recordings may be taken at anytime during the service. 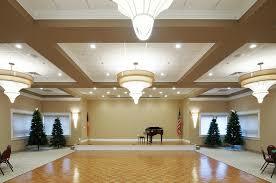 The bridal couple should instruct the photographers to speak with the Pastor prior to the service for instruction. During Great Lent or Holy Week. The purpose of each part of the marriage ceremony is to emphasize the relationship of oneness of the couple to each other and to the Church. The ring has been a symbol of faithfulness from the earliest of biblical times, both of God to man and of man to his bond of marriage. The circle is the shape symbolizing eternity. It represents the love and faithfulness of bridegroom and bride to each other. Often, the Blessing of the Rings takes place during the Engagement celebration of the couple to be wed. The Priest joins the right hand of the bride to the right hand of the bridegroom, recalling the oneness of Adam and Eve. He places his hand over theirs symbolizing the sanctifying blessing of their union. The bridegroom and bride are asked to respond three times to the inquiry of the priest. They each state their willingness to assume their proper roles as husband and wife in the context of St. Paul’s Letter to the Ephesians. The Scripture readings include the most revealing sections of the New Testament relative to marriage. The important point made by St. Paul in the Epistle to the Ephesians is that of the union of Christ with the Church, His Body, as the model of the relationship between husband and wife. Following the Epistle is the Gospel reading from St. Matthew (19:3-9) that speaks of a man joining together with his wife and the two shall become one, giving further elucidation on the bond of union that is to exist. The weddings chaplets placed upon the bridegroom and the bride are of Biblical origin. The crowns are the sign of the glory and honor with which God crowns the bride and the groom during the Sacrament. They are crowned as the king and queen of their own kingdom, the home. Wine is a gift of God to man. By presenting the blessed wine to the couple, the Church wishes that their life be full of happiness. The drinking of wine from the common cup serves to impress upon the couple that from that moment on they will share in the joys and difficulties of life together. After the singing of the “Lord’s Prayer”, the newly married couple receives the blessing of the Church, sending them into the world to now live as husband and wife, king and queen of their kingdom and family. 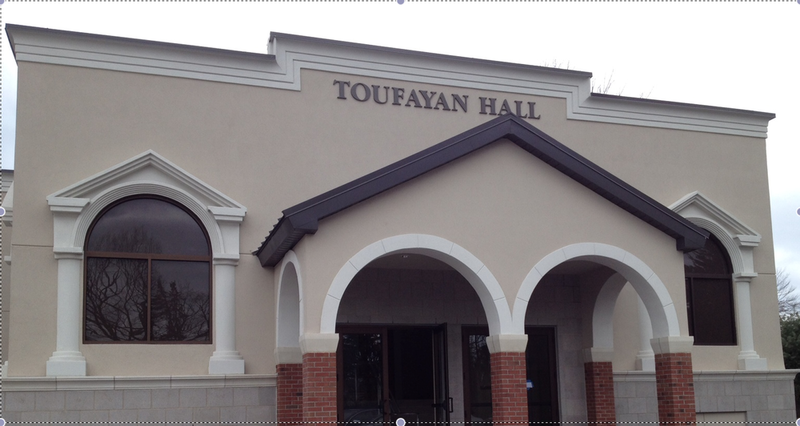 Toufayan Hall is an ideal place for your wedding reception. 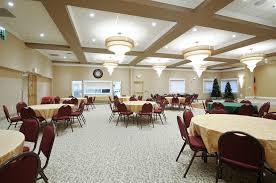 The hall offers an unbeatable location for your guests travelling to Livingston, New Jersey. 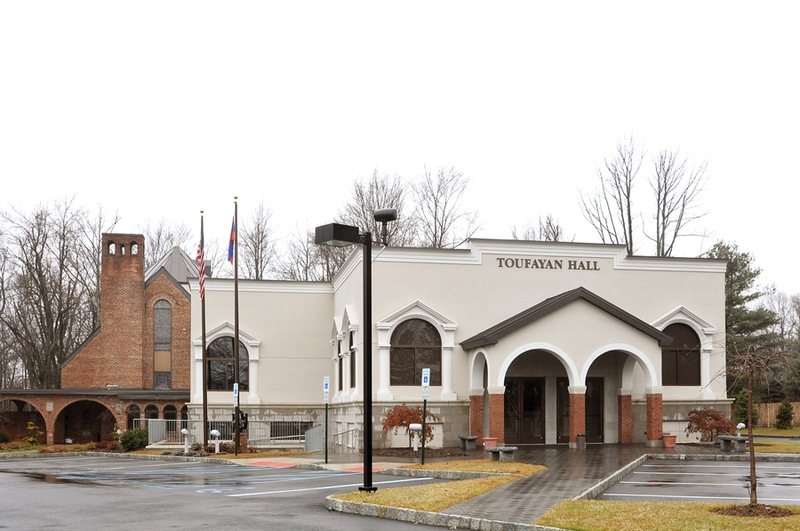 Centrally located, Toufayan Hall is 24 miles from New York City and conveniently located near Routes, 24, 78, 280, 287 & 10.